Brackley Town begin their defence of the Buildbase FA Trophy and should get the job done at the first attempt. The holders entertain lowly Nuneaton Borough in Saturday’s third qualifying round tie. But boss Kevin Wilkin knows his players have to be more ruthless in the final third if they are to get past the Vanarama National League North basement boys. Saints have squandered chances in recent games, meaning they have drawn four of their last five league outings, three from winning positions, at the cost of crucial points. 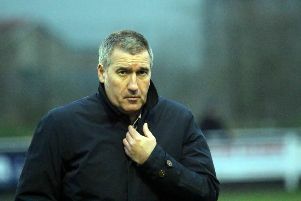 But now Saints must focus on the FA Trophy and Wilkin said: “In the run to the final last season we conceded only three goals in 11 games to win it. There were several clean sheets and that’s something we need to improve on this time. “Players understand they need to get back to keeping clean sheet for us to have a positive season. I’ve got players who can go to another level but we want to be successful here and now.